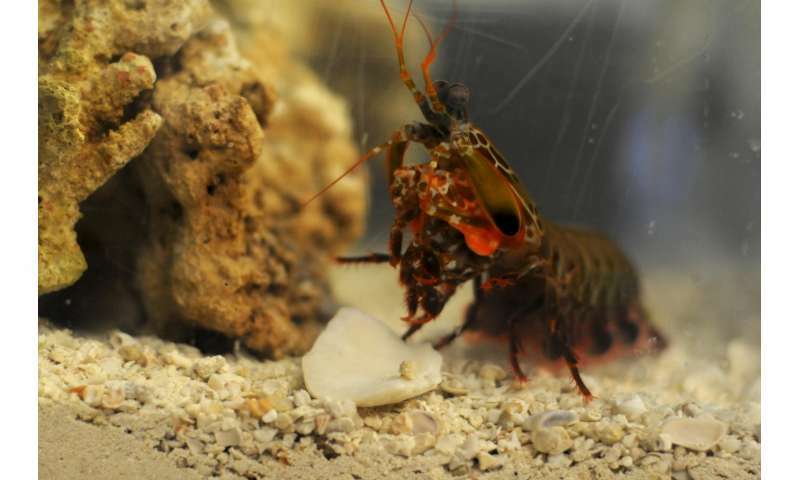 Researchers at the University of California, Riverside and Purdue University are one step closer to developing super strong composite materials, thanks to the mantis shrimp, a small, multicolored marine crustacean that crushes the shells of its prey using a fist-like appendage called a dactyl club. Their latest research, to be published in the journal Advanced Materials, describes for the first time a unique herringbone structure, not previously reported in nature, within the appendage's outer layer. It is this tough herringbone structure that not only protects the club during impact, but also enables the mantis shrimp to inflict incredible damage to its prey. Mantis shrimp, also called stomatopods, come in two varieties: 'smashers' and 'spearers.' While spearers kill prey by driving a spear into soft-bodied sea creatures, smashers kill hard-shelled prey such as crabs and snails by pulverizing them with incredible speed and force. The dactyl club can reach an acceleration of 10,000g, unleashing a barrage of impacts with the speed of a .22 caliber bullet. For the past eight years, David Kisailus, the Winston Chung Endowed Professor in Energy Innovation in UCR's Bourns College of Engineering, and his team have been studying smashers' dactyl clubs and using them as inspiration in their development of next generation composite materials. Their research is already being translated into real-world products by Nature Inspired Industries, a recent startup led by Kisailus that spun out from UC Riverside's Office of Research and Economic Development. In previous work, including a 2012 study published in the journal Science, the researchers identified several different regions of the dactyl club, including an interior region—called the periodic region—with an energy-absorbent structure that also filters out damaging shear waves, which travel through objects when they are under stress. This energy absorbing "periodic region" consists of two phases: an organic phase made of chitin—a compound found in the shells of insects and crustaceans—arranged in a helicoidal structure that resembles a spiral staircase, and an inorganic phase comprising amorphous calcium phosphate and calcium carbonate. The current research, funded by the Air Force Office of Scientific Research under a $7.5M Multi-University Research Initiative that Kisailus leads, describes for the first time a unique herringbone structure within the dactyl club's outer layer, called the impact region. The impact region is a crack-resistant layer that shields the club as the mantis shrimp pummels its prey. However, unlike the periodic region, the impact region consists of crystalline calcium phosphate (the same mineral found in human bone) surrounding the organic chitin fibers. The researchers found that these heavily mineralized fibers were compacted to form a "herringbone structure" that is significantly stiffer than the structure in the periodic region. The highly ordered compacted herringbone structure is a pitch-graded sinusoidal arrangement of helicoidal chitin fibers mineralized with highly textured calcium phosphate. 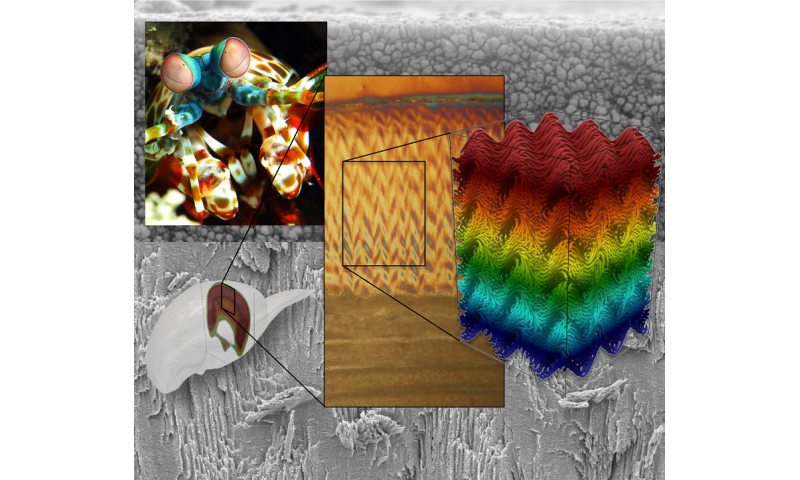 This unique herringbone structure not only protects the club from failure, but also enables the mantis shrimp to inflict incredible damage to its prey by transferring more momentum upon impact. Although the mechanism of the formation of the herringbone structure has yet to be confirmed, Kisailus speculates that the difference in stresses during the formation of the crystalline material in the impact region causes the helicoidal arrangement to buckle, which can be viewed under high power microscopy as a herringbone pattern. Adding an additional layer of complexity, the very outer layer of the impact region is different again, offering a thin, particle-like coating around the surface of the dactyl club that acts to delocalize stress that might induce catastrophic failure within the club. Nicholas Yaraghi, a graduate student in Kisailus' group who led the current research, said this is the first time the unique herringbone structure has been observed in Nature. "We knew from previous studies that the impact region allows the mantis shrimp to transfer incredible momentum to its prey while resisting fracture, but it was exciting to reveal through our research that the properties of this highly impact-resistant material are created by the novel herringbone structure," he said. In order to confirm their hypotheses, Kisailus and his research group teamed up with Pablo Zavattieri, Associate Professor of Civil Engineering and University Faculty Scholar at Purdue University, and his team to perform finite element analyses to understand the role of these structures. The researchers also fabricated the herringbone structure using synthetic materials and a 3D printer. Zavattieri and his student Nicolas Guarín-Zapata built computational models that replicate the local details of the herringbone structure. These models explained that damaging stress can be more uniformly distributed, mitigating catastrophic structural failure. Compression testing of the 3D printing biomimetic composite also helped prove that the herringbone structure makes the impact region even more effective than the periodic region in redistributing stress and deflecting cracks. "While the computational modeling results gave us compelling confirmation of the redistribution of stresses in these structures, the "wow" moment came when we tested our 3D printing samples," Guarín-Zapata said. Kisailus said the discovery of the highly impact-resistant herringbone structure adds new inspiration as his team designs the next generation of materials for a variety of applications, including aerospace, automotive and armor. "The smasher mantis shrimp has evolved this exceptionally strong and impact-resistant dactyl club for one primary purpose—to be able to eat. However, the more we learn about this tiny creature and it's multi-layered structural designs, the more we realize how much it can help us as we design better planes, cars, sports equipment and armor," Kisailus said. Kisailus said recent advances in 3D printing techniques and modeling are making it easier than ever to translate the mantis shrimp's weapon into new materials. "By using 3D printing techniques like those used by Zavattieri's team, we can actually take what we've learned about the architecture of the dactyl club and manufacture new composites with traditional engineering materials like polymers and carbon fiber," Kisailus said. In fact, he says that his team is already fabricating the second generation of composites that incorporates not only the energy-absorbing component, but the stiff outer layer inspired from the mantis. He has demonstrated this by producing a helmet with this hard coating.